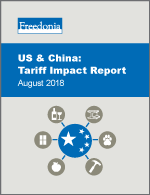 In this third tariff white paper, analysts from publisher The Freedonia Group contemplate the current realities and future possibilities of trade relations between the US and China, summarizing the potential impact of proposed and enacted tariffs on affected industries in both countries. The Freedonia Group has a long history of analyzing US and global industries as well as trends in international trade. In addition, corporate researchers in Freedonia’s Beijing office conducted interviews with Chinese market leaders to provide a ground-level view of how impacted Chinese companies are responding to the US actions.